In this latest blog post from The Odyssey Scoop we learn that the 30th birthday bash will take place on a Disney cruise to the Bahamas. Sure, that's where Mary Barclay wanted to go for vacation, but this whole thing sounds weird to me. Maybe things are evolving and this is the next site of the ToO or SS convention. Breaking News: Mickey and Minnie Mouse to get relationship advice from a devout Christian with national security clearance. What do you think of this new live show approach? Sorry I couldn't hear you over the sound of my laughter at focus for thinking this was a good idea. I just wonder how many people will actually be able to afford something like this. But maybe we need to wait until there is more official announcements about it, there might be extra details we don't know about. All I do know is... getting to go on the Disney Dream would be exactly that, a dream. *SIGH* It sounds really cool though, I mean, this is pretty huge for AIO/Focus when you think about it. I don't know... this may not be a horrible thing. The main thing I see is that this is a Focus event, not an AIO one. Focus is having a few day "Family cruise." I'm sure many families have glanced longingly at Disney cruises but noticed the price tag and moved on. But, Focus wants to (I know this isn't a good dichotomy to have, but I guess I'll use it) have a "Christian" Disney cruise, in which families can both enjoy Disney fun, and "Christian" and family fun. Which, kinda makes sense, especially to the target audience of Focus. The cost issues are still there, but this is what Focus decided. That leads to the AIO anniversary, which honestly seems like more of a side event, rather than a focal one. Maybe I'm just reading this wrong, though, since AIO has been a somewhat major part of Focus in general.... I agree this is disappointing, but it makes sense that if Focus is going to have a big event, AIO would be worked into it. However, I wonder how many AIO fans it will inhibit from attending due to the nature of the location. AIO fans that probably would have traveled to the show if it weren't a cruise. But I can't say for sure, who knows, maybe they will actually get a lot of Odyssians going (specifically for the AIO Live Show). Hmm, interesting. I'm definitely surprised, but I'm sure a lot of thought went into this. I probably won't be able to attend, but there are no guarantees I would have been able to make it to anything else that was planned either. Yeah, this is patently ridiculous. Perhaps though, as you guys pointed out, the fact that this is clearly a Focus-centric event means that there will still be a regular Live Show performance apart from the cruise. I feel like it makes sense. Thanks, Dan, for giving us memes to express the absurdity of this situation. Perhaps though, as you guys pointed out, the fact that this is clearly a Focus-centric event means that there will still be a regular Live Show performance apart from the cruise. Yeah, that's what I'm kinda feeling/thinking. Forgive me for bumping an old topic, but I had to throw in my two cents here. I've always said that I don't care what continent the live bash happens on, I'll be there. But.....I'm not going on a Disney cruise, by myself, a 31 year old single man. Yikes. Yep, gonna have to sit this one out. I'm volunteering with AIO/Focus to help promote their 30th anniversary and OAClub, and as I was talking with the intern interviewing me she kept referring to the cruise and 30th birthday bash as two separate things. 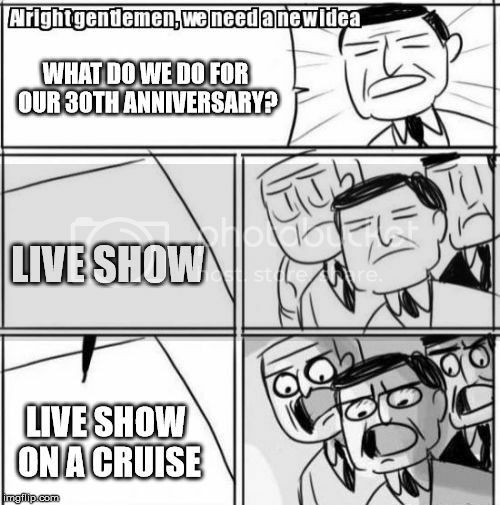 Soooo, though I'm not 100% certain, my senses are telling me yes, they will be having a live show on the cruise BUT, I'm thinking they might be having a separate show/birthday bash elsewhere. So lets just keep our fingers crossed and not judge things too prematurely until more information is revealed. I just hope they start revealing more info soon.. The AIO ambassador idea sounded like fun. I haven't signed up yet because I'm not sure of how much time commitment would be needed and if it would cost me anything. Did they give you any info on this, snubs? I'm going to be promoting through my fan page (which shouldn't require any more time than what I already spend on posting content), and she said they would be giving me pre-made things to share. Since you are interested, I would go ahead and apply. As Focus told me (when I emailed them for more info), you're application does not obligate you to serve or volunteer; it simply allows their staff to get back with you. I'll be on the cruise! Are any of you coming, too? Hope to see you there! Wow, that's awesome! Unfortunately, I won't be there (even though I would like to be - my work schedule isn't flexible, so I knew the second I saw the dates I couldn't go) but I really want to hear about the cruise and live show and everything! Make sure you tell us all about it! 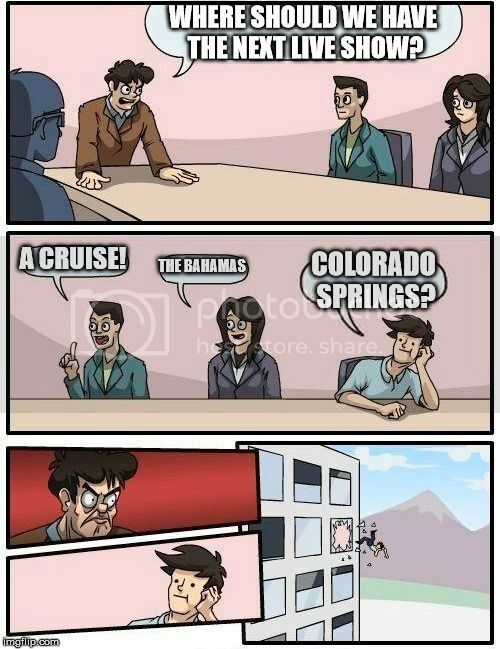 What's the deal with cruises? DC Talk's first reunion concert after 20 billion years was on a dumb cruise ship, too. "Dumb cruise ship"? You kidding?!? I agree with Top. Any cruise pertaining to AIO that I can't attend automatically makes it a dumb cruise ship. I knew right when it was announced for the first time I wouldn't be able to go, and I'm a little surprised at disappointed I still am. A chance to meet and hang with the actors and writers for...a week?! I'm really excited to hear more of the Live show, though, and when it'll be released. From what I've been seeing from the cast on Facebook they're having a blast.